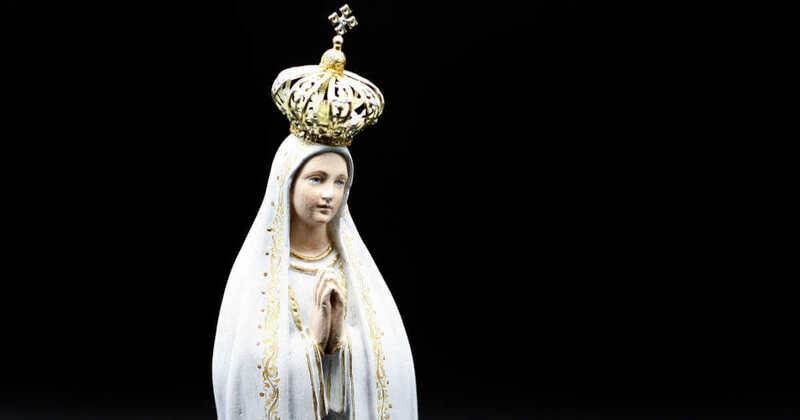 May 13 - Our Lady of Fatima - My Catholic Life! The ancient Greco-Roman world that Christianity replaced was deeply devoted to the gods, not God. Its landscape was dotted with a thousand shrines, oracles, sacred caves, and holy mountains where the god of this and the goddess of that lived or lurked. And the pagan faithful—and they were faithful—trusted that someone among this government of gods could be petitioned for this need or lobbied for that favor: so that the battle would be won, the harvest plentiful, the illness brief, the baby a boy, or the sea calm for the voyage. This all made sense. Just as human nature was expressed in countless persons, so too would the divine nature be manifested in myriad gods and goddesses. Countless stars populated the blackness between earth and sun. So too did gods thicken the reality between the realm of the flesh and the realm of the spirit in ancient paganism. Over a span of centuries, Christianity methodically and inexorably displaced this ancient worldview. The Church rolled slowly on, like a colossal glacier, from east to west and south to north, gathering, pushing, and budging everyone and everything to the margins as it carved a new landscape for a new people. Yet the old worldview, while theologically childish, had deeply human elements. It is natural to think that between man and god there would be sub-gods or something of the like. It is natural to imagine that a local god would have local concerns and give a local answer to local people. It is natural to presume that a high summit is holier than a flat prairie and that to visit it, to make a petition, and to leave an offering would merit more than to do nothing at all. Greco-Roman paganism expressed the deep, universal, religious impulse found in every culture. Christianity built on the same human foundations as paganism, and it responded to the same human longings. But Christianity built on that sound foundation a solid house of revealed theological truth. And that truth revealed that the one God—omniscient, omnipresent, all powerful—expresses Himself through the tool of creation, though He Himself is not creation. Christian truth also revealed that God not only acts through secondary causes but is also approached through them. So bread and water become Christ’s Body and Blood, water is blessed by a holy man and wets our foreheads when we mark ourselves with the cross, and certain men and women live so heroically the mystery of God in their lives that we call them saints. This constellation of saints has long replaced the confused, but understandable, pagan pantheon of old. Instead of a god of the sea, a god of war, and a god of rain, we have patron saints for sailors, soldiers, and farmers. We have saint intercessors for the mentally ill, for pregnant women, for impossible causes, and for a happy death. Catholicism has a saint for everything and for everyone, forming a more theologically satisfying worldview that nonetheless responds to the innate religious impulse of all men. 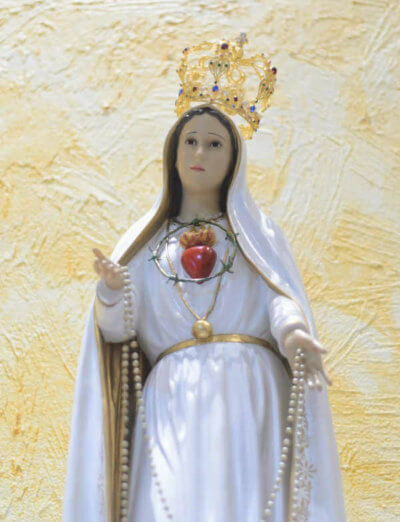 Today’s Memorial celebration commemorates the greatest saint of all, Saint Mary, as she manifested herself to three humble children in the Portuguese village of Fatima in 1917. Our Lady, the only mother ever chosen by her son, appeared in a particular place, at a particular time, to a particular people, to satisfy a particular need. She spoke to the children deep theological truths about heaven, hell, and purgatory. She performed a publicly witnessed miracle that made the sun dance, asked for increased devotion to her Son Jesus Christ, and pleaded for reparation for the many sins committed against Him. A shrine was built in the Blessed Mother’s honor at the site of her apparitions, which has welcomed millions and millions of pilgrims, including popes, over the decades. Our Lady is for the whole Church, of course, but she is closer to the faithful when she comes to them on their own terms—in their own tongue, skin, and dress, hovering over their own soil. There is one Mary, historically and theologically. There are many Marys, culturally and symbolically. Pope Saint John Paul II was shot on the Feast of Our Lady of Fatima, May 13, 1981, in St. Peter’s Square in Rome. He was grievously injured but survived. He later said that one hand pulled the trigger, but another hand guided the bullet. He went on pilgrimage to Fatima to give thanks for that saving hand. The bullet that penetrated his torso, and was removed by doctors, was placed into the silver crown of Our Lady of Fatima. It rests there today. We honor Mary for many graces, we petition her for many favors, and we thank her for many gifts—for the battle won, for the plentiful harvest, for the healthy baby, for the calm sea, and for the lives saved, dramatically, from an assassin, or mundanely, from everything else. Our Lady of Fatima, your miraculous apparitions fill us with hope that you follow our concerns, intervene in our lives, and demand of us greater fidelity. May we heed your words and your warnings and carry out God’s will with your own life as our example.